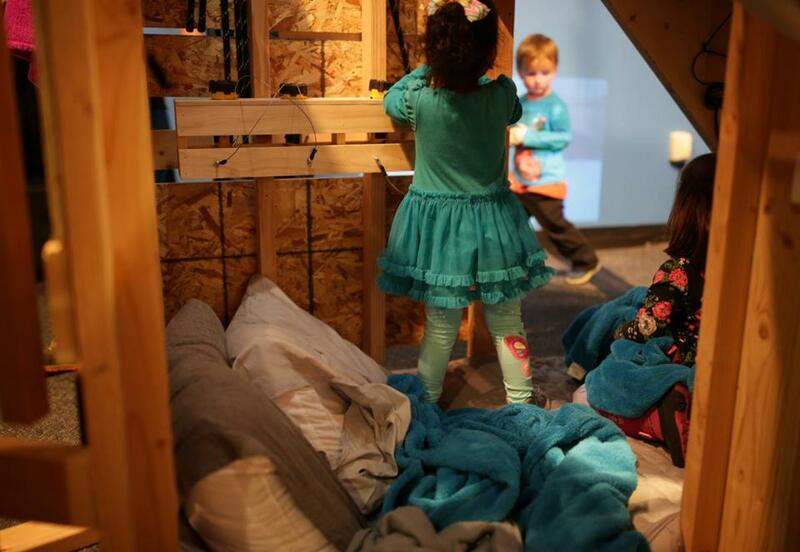 Kids explore artist Amy Archambault‘s exhibit, “Hideout,” at the Boston Children’s Museum. A child, no older than 3, runs up to the exhibit and makes himself at home. He crawls inside, making little effort to control his excitement or his “inside voice,” and can’t resist playing with the materials left there by the artist. In most museums, with most exhibits, this behavior would be met with swift action by the parents and gallery attendants. Here though, at “Hideout,” the latest installation at the Boston Children’s Museum, the adults just smiled. The child’s reaction was exactly what Amy Archambault had in mind when she put together the artwork, a mass of chairs and blankets and cushions meant to emulate the forts you built as a kid. Archambault, a Chelmsford artist who teaches at Holy Cross, is a strong believer in the power of play, so when the museum reached out to her last year about working on an installation, that’s where her mind gravitated. So, she reached out to some of the preeminent fort experts in the field for inspiration. Archambault talked to a few friends who hold early education teaching jobs in Massachusetts, Pennsylvania, and Connecticut, and had them give their classes a prompt: What were the forts you built (or still build) at home like? The students, mostly in second through seventh grades, mailed their drawings and explanations to Archambault, who went through them and identified the common themes. Kid-assisted blueprints in hand, she went to work. The students’ influences are everywhere. One student drew a fort under the stairs, so Archambault constructed a set of wooden steps that serves as a roof, of sorts. Small, confined spaces were also widely suggested, so she made sure to include a few cubby areas, perfectly tyke-size. Blankets and chairs, as any kid knows, are prime construction materials, so Archambault made sure to scatter plenty of those around as well. The result is a friendly and inviting structure that naturally attracts youngsters. According to arts program manager Alice Vogler, “Hideout” is perfect for the museum and right in line with what they want from their exhibits. Based on a brief observation, that certainly appears to be true. Children would spot the structure and make a beeline for it, clambering and crawling all over. “Kids just know what to do with it,” said Archambault. She hopes the exhibit will inspire younger visitors to get cracking on their own mini architectural masterpieces. “I really hope the kids go home and make some forts,” she said. “I’m a big proponent of playing and being curious with what’s around you.” Adults shouldn’t feel left out. If they crouch down a little, they can fit into the fort and reminisce about their earlier years.